This is one next level dessert! 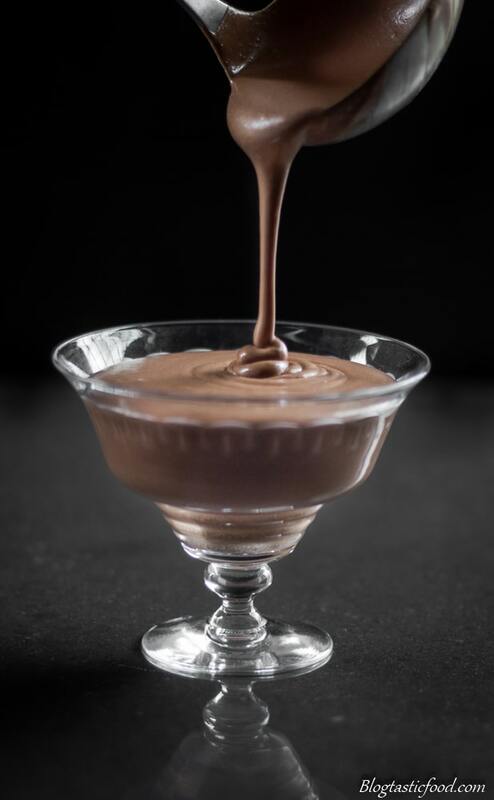 It tastes absolutely amazing and I guarantee you that if you serve this chocolate mousse to your guests, you are going to look like the most amazing cook in the world. Which is why I am so pumped to share it with you. The great thing about this dessert is that you can just put the mousse in your desired glasses or ramekins etc. and then just keep them in the fridge. Serving them will be effortless. Once those cherries are soaking and the mousse is set that’s it, the is dessert done. All you have to “worry” about from that point on are the savoury dishes (if you plan on making dinner of course). So trust me when I say, this is one of the last recipes you want to be discouraged about. Any chocolate will work if have the right measurements. So if your reaction to mint chocolate is “ewww”, first of all, what wrong with you!? Second, you can change it to whatever you like. If you want my personal recommendation, I say go for a dark chocolate. And I say that because this recipe requires quite a bit of cream, which will lighten the chocolate up. You are also going to stir the chocolate through a sabayon which is like a souffled egg mixture (more info about a sabayon down below). This will also mellow out the dark flavour of the chocolate. However, if dark chocolate really isn’t your thing, feel free to use milk chocolate or even white chocolate. Just make sure that the chocolate is melting over a gentle heat ladies and gents. If you try and melt chocolate over very high direct heat, the chocolate will not melt, it will overheat. Leaving you with a big clumpy mess. So at some stage in the recipe, you’ll need to beat the eggs, sugar and alcohol in a bowl over a water bath until pale and thick. This is what’s known as a sabayon. The mixture needs to be whisked fairly rapidly so having an electric beater can definitely be handy. Although it’s not the end of the world if you don’t. If you look at the step by step photos below, you’ll notice that I just used a whisk because I was cooking outside where there were no power plugs. And honestly guys, I know a lot of people make it seem like hand whisking takes ages and it’s super caveman like but it really isn’t that bad. So don’t stress. While you beat the egg mixture over the heat, you should start to see it foam up, and that’s when it starts to thicken. From there, you just remove the bowl from the heat and keep beating until the egg mixture goes fluffy and pale. A sabayon mixture can be served on its own with fresh fruit, but we are going to use it to make our mousse super light and fluffy. And that is all there is to it. I really encourage you to try this recipe, especially if you have guests over. I promise you it will put smiles on peoples faces. If you want to subscribe to this blog, please do so. You’ll get a new recipe sent to your E-mail every week, and you’ll also get a free E-book. Also, if this dessert rocks your socks off, then you’ll definitely love this Cinnamon Infused Creme Brulee recipe too!! Mint chocolate is my all time favourite chocolate. So I decided to experiment with it. 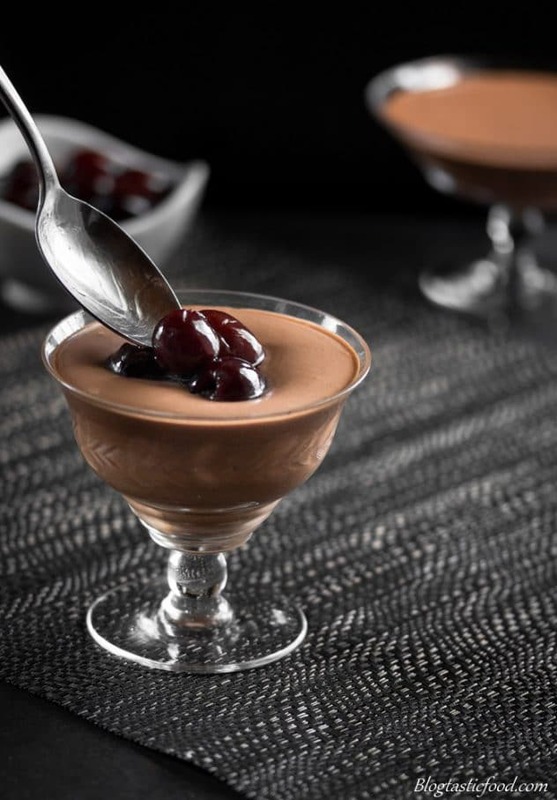 And what better way to do that than to make an amazing, smooth, rich mousse with cherries soaked in alcohol. Add the Grand Marnier and the cherries to a jam jar or something similar. Place in the fridge until needed. Whisk the cream in a large bowl until soft peaks (meaning until the cream is thick enough to hold its shape, but is still soft and smooth). Fill a saucepot a quarter of the way up with water, then bring it to a very gentle simmer (this is called a “water bath” or “bain marie” in French). Add your chocolate and butter to a large heat-proof bowl, then place the bowl over the water bath and stir the chocolate as it melts. As soon as the chocolate has melted, take the bowl off the heat and set aside. Get another heat-proof bowl and put your eggs, Grand Marnier and sugar into it. Put over the water bath and whisk away. Once the mixture starts to foam and thicken a bit, take the bowl off of the water bath and keep whisking the egg mixture as the bowl cools down. The mixture will go pale and thick. 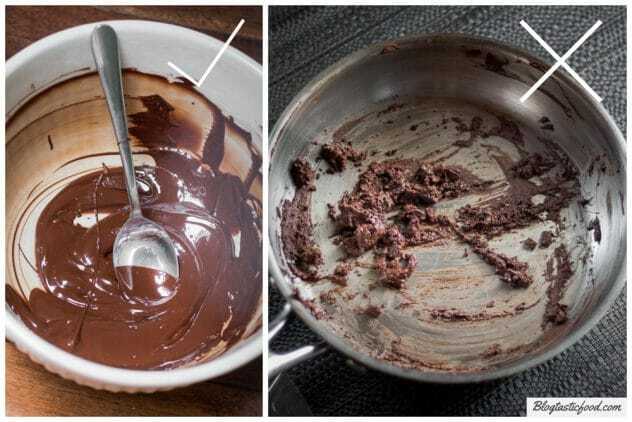 Gently fold the melted chocolate through the sabayon (the souffled egg mixture). Add half of your whipped cream and gently fold through, then do the same with the other half. 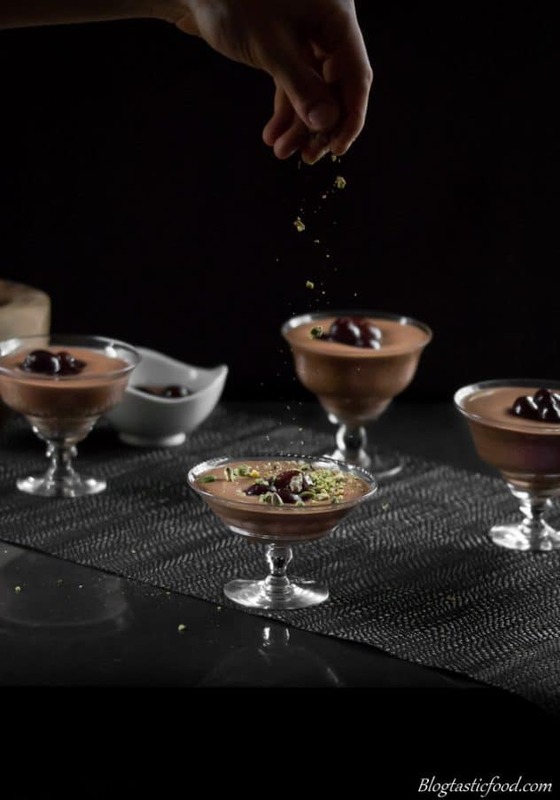 Get something that you can serve this mousse in, such as dessert glasses or ramekins. Fill them up to the top with the chocolate mousse, then set in the fridge (for at least 1 hour). 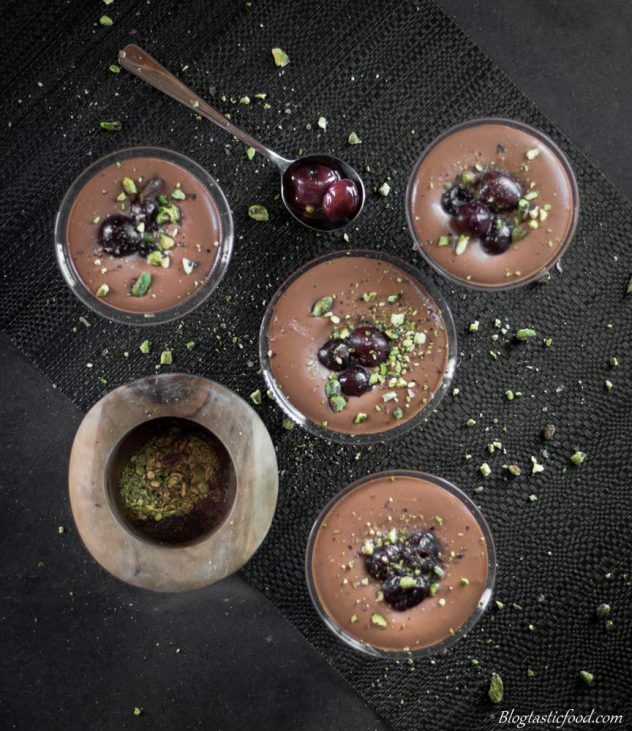 Once the mousse is set, top with soaked cherries and a sprinkle of crushed pistachios. Enjoy! You can make this dessert the day before, then serving this dessert will be completely stress-free. This mousse looks very appealing when served in fancy glasses or ramekins. You don't have to use mint chocolate if you don't want to, use whatever flavour you like. Melt your chocolate slowly and gently and don't leave it on the heat. If you overheat the chocolate, it will go all clumpy. If you have an electric beater to whisk the sabayon, then use it. If you don't have one, no big deal, a whisk is perfectly fine. Rich and creamy dessert. Copha is not something we see very much of here in Canada. I think the use of butter, lard, shortening or solid coconut fat is more common. Great. Just ate but I am hungry again, haha! This looks super delicious! LOVE this recipe and the pictures are gorgeous!! What a lovely decadent dessert. Chocolate and cherries are among the ‘classic’ dessert pairings that everyone enjoys. Chocolate and oranges are delicious too. I have to confess that I cheat and use a blender mousse recipe. Thanks. I am very excited about the new format and hope we will have as good a response on this one. This looks so so delicious Nick. I like the idea that you can make it ahead and have it ready, and have time to make the rest of the meal. And those cherries are the prefect touch! thanks! Oh wow this looks so good – and with Grand Marnier? Pinned to try for my hubby’s birthday! Thanks for sharing on the What’s for dinner link up! This looks so lush and chocolatey! And mint/chocolate is one of my all time fave combos. YUM! What a fun and tasty adult dessert. The booze soaked cherries would be amazing…I use them all the time in Black Forest Cake. Perfect dessert for entertaining. I absolutely love this recipe! It makes a perfect dessert and as you say, friends and family will be so impressed! I’m going to have to invest in some Grand Marnier! OMG that chocolaty goodness pouring into the dessert glass…yum! This mousse has some serious decadent flavors going on! A perfect way to end an evening! 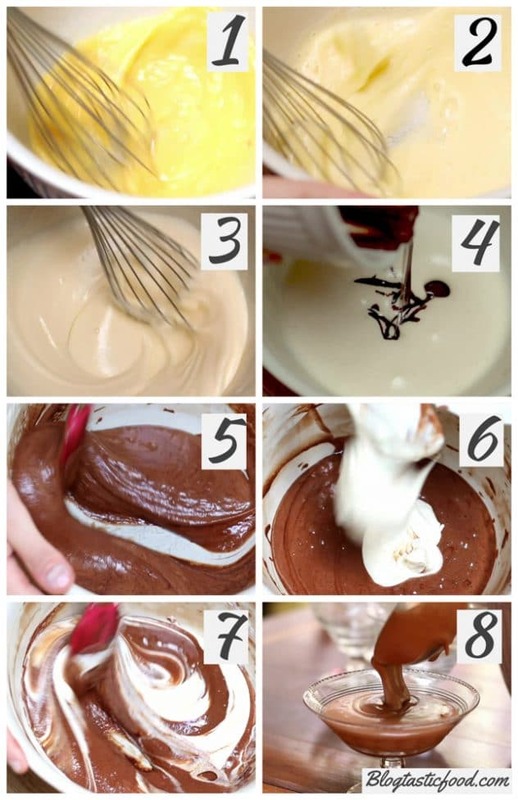 I LOVE a good chocolate mousse, it looks just perfect! And those booze soaked cherries are such a great idea. Can’t wait to make it! You had me at booze soaked cherries. OMG. Alcohol soaked cherries are seriously one of my favorite things. Having them with mint chocolate mousse really puts it over the top. This is a winning recipe! I’m with you on mint chocolate! Sounds wonderful! And that looks just luscious. You had me at booze soaked cherries! Except I’d probably be eating all of them off to the side while no one was looking! I bet they make the perfect compliment to the rich chocolate. First of all, these pictures are GORGEOUS. Secondly, I’m desperately craving some chocolate mousse now and I need to go to bed. Waaaaaaah. I’m not a big chocolate person, so I generally pass on chocolate desserts. But those booze soaked cherries!! I’d like a big bowl of just those, please and thank you! Yum!! This mousse looks like the perfect holiday dessert. I think I would devour 4 of these at once! haha I am glad to hear it Sam!! Thanks for your comment! Yes you can make them with any dessert you like and they will keep in the fridge for ages!! Thank you Kim I really hope you enjoy it! Oh my goodness! These photos are stunning! 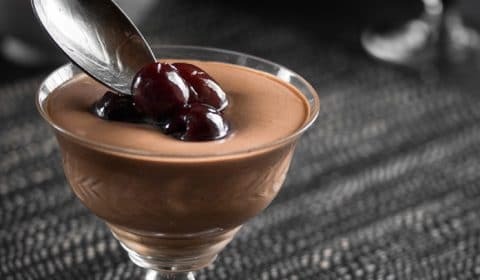 I love Chocolate Mousse and I really need to try this recipe soon! This would be the perfect ending to any dinner. Cream and chocolate, I mean seriously is there any better way to end end a delicious dinner than having an amazing dessert. Haha Thank you!! The great thing about this is that you can prepare it in about 30 minutes. Then just keep it in the fridge. then serving them requires 0 effort after dinner.